The superseiner Napoleon, first of a three-boat contract signed between Peterson Builders, Inc., Sturgeon Bay, Wis., and Ocean Blazer, Inc. in July 1978, was turned over to her owners recently just before leaving Sturgeon Bay. To be operated under the Venezuelan f l a g by Venatun, Inc., the new seiner will be under the command of Capt. Manuel Elduayen, t e c h n i c a l d i r e c t o r of Noratun Venatun. The firm has two other boats on order at the present time, including the third of PBI's series, the Jane, which will be delivered in the fall of 1980. The same owners have operated the superseiners Olivia and Lucille for several years. The new boat will fish for Star-Kist. 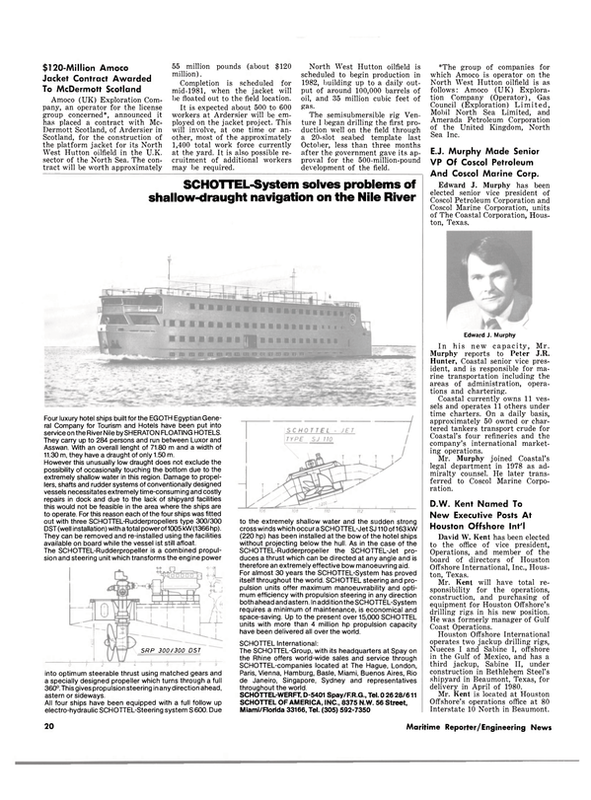 Of a completely new design prepared by San Diego, Calif., naval architect Ivo Zaninovich, working closely with the owners, the vessel's working plans were prepared by the Sturgeon Bay firm of R.A.
Stearn, Inc. N / C lofting and parts programming were accomplished by Designers & Planners, Inc., u s i n g the "AutoKon" system. Peterson Builders' computer-controlled plasma cutting facility was used to cut all steel and aluminum parts for the series of boats. Featuring the newly developed Marco WS444 "Superseine" winch and a 56-inch Marco power block, a remarkably high productivity is expected for the Napoleon and her sisterships. The Napoleon will travel to and from the fishing grounds at about 16 knots, propelled by her EMD 20-cylinder Model 645-E7 engine with Falk 3548MRV 5:1 reverse reduction gear with slip clutches. The 128-inch five-bladed Coolidge stainless-steel propeller turns on a 12-inch-diameter tailshaft in Waukesha oil-lubricated bearings. A Mathers control system, with wheelhouse and port bridge wing control stations, is installed. The steering engine is a Frydenbo model HS120 with two 15- horsepower hydraulic power units which may be operated in parallel or individually. Controlled by the Sperry gyrocompass and autopilot, the s t e e r i n g gear can move the rudder hardover to hardover at full power in less than 15 seconds. The 48-inch Schottel bowthruster is driven by a Detroit Diesel Allison 12V-71 engine with Twin Disc MG-514 gear and has a Mathers control system interfaced with the autopilot, which enables the ship to hold to a predetermined heading with no way on. The 900-kw total electrical power is provided by three Caterpillar Model 1)353 engines driving 480- volt 3-phase Kato brushless generators. Power is distributed by a Federal Pacific p a r a l l e l - t y pe main s w i t c h b o a r d , Cutler-Ham- mer motor starters, and Westinghouse distribution panels. The main hydraulic system has two sources of power: a Caterpillar D353E close coupled to a Marco multipump drive located on the port side of the upper engine room, and directly beneath it, a Marco free-standing m u l t i p u mp drive with an emergency coupling connection to the forward end of the port lower generator set. The vessel's tuna catch is refrigerated by an ammonia system. Four 8-cylinder Vilter compressors driven by 100-horsepower Lincoln motors circulate ammonia through a p p r o x i m a t e ly 26,000 feet of galvanized pipe coils arranged around the walls of the 17 brine wells. Very comfortable accommodations for a crew of 23 are provided, including private staterooms for captain, navigator and chief engineer. The crow's nest is equipped more extensively than normal, including remote controls for both VHF and single sideband radios, h e l i c o p t e r communications, and bowthruster control. The wheelhouse and radio room are equipped with two Sperry MK127E radars, Sperry MK37 gyropilot and 8T magnetic compass, Wesmar SS170 scanning sonor, Elac navigational depth recorder with digital readout and alarm, Taiyo VHF and marine band automatic direction finders, Hy-Gain VHF radios, two Hull 2320 single sideband radios (one with Northern 1-kw linear amplifier), Magnavox 1142 satellite navigator, N o r t h e r n emergency radio, and Honor Marine telephone and public address systems. In addition to approximately 80,000 gallons of diesel fuel capacity (in dedicated tanks) the ship carries 12,000 gallons of turbine fuel for her helicopter, about 2,000 gallons of gasoline for speedboats, and miscellaneous lube oil, potable water, solvents and dirty oil. A Maxim desalinating plant is provided, and all vessel sewage is handled through a Red Fox Model RF750 marine sanitation device. The vessel is completely painted with a system specified and provided by the Pro-Line Paint Companv of San Diego, which includes epoxy, inorganic zinc and linear polyurethane finishes for the ultimate in protection against corrosion. Other means of reduc- reducing maintenance costs and fighting corrosion were employed in the vessel's construction, including extensive use of stainlesssteel plating and chafing bars in areas of high wear; noncorrosive m a t e r i a l s f o r piping systems; many of the Pacific pumps have epoxy fuse-coated impellers and cases; pump motor windings are epoxy encapsulated ; integral heaters are provided for brine circulating pumps in the pump alley, and PVC piping is used extensively. The ventilation throughout the ship is provided by Buffalo Forge fans. Just after the delivery of the Napoleon, the second vessel in the series for Ocean Blazer, the Captain Frank Medina, for Capt. Joe Medina Jr. of San Diego, was launched. Now in the outfitting stages, the Captain Frank Medina will be delivered in late spring 1980, followed by the Jane in the fall of 1980.